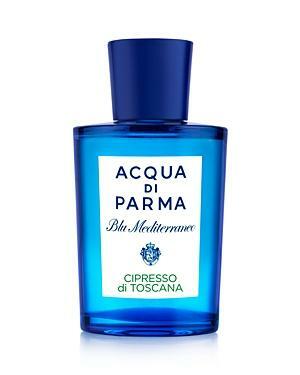 Acqua Di ParmaAcqua Di Parma Blu Mediterraneo Cipresso Di Toscana Eau De Toilette 2.5 Oz. Key Notes: Star anise, elemi, orange, petitgrain, sage, lavender, cypress, pine About The Fragrance: Cipresso di Toscana is an Italian interpretation of the classic fougere. The fragrance opens with exhilarating top notes of Star Anise and Elemi, evoking a lively breeze, combined with sparkling notes of Orange and Petit Grain. At the heart of the composition, Sage and Lavender bring an aromatic note while balsamic notes of Cypress and Pine evoke the sensation of tranquil wellbeing. Acqua Di Parma Blu Mediterraneo Ginepro Di Sardegna Eau De Toilette 2.5 Oz.